Status: Common regular spring and fall migrant statewide. Common regular breeder east and central, rare casual west. Documentation: Specimen: UNSM ZM6932, 29 Jul 1902 Carns, Keya Paha Co. Arrival is in early May, with earlier reports 16 Apr 2015 Madison Co, 20 Apr 2005 a banded male recaptured in Hall Co, and 21 Apr 1957 Douglas-Sarpy Cos.
Migrants occur statewide but are most common in the central (Rapp et al 1958; Johnsgard 1980). A male fitted with a geolocator yielded the following spring migration itinerary: six days in the Bahamas, on 14 May a flight northwest across the Gulf of Mexico to Alabama, on to Kansas two days later (16 May), arriving at a Nebraska breeding site on 20 May (Renfrew et al 2015). High counts: 208 in Hall Co 10 May 2003, 125 in Sheridan Co 18 May 2009, and 100 at Rowe Sanctuary, Buffalo Co 24 May 1998. Summer: Breeding habitat for this species is native moist or sub-irrigated meadows; it was once common in lowland, riparian prairie that existed along most major river systems and in moist lowlands throughout the Sandhills. Drainage of many of these meadows and conversion of much of this habitat to cropland, especially in eastern Nebraska, has reduced numbers and caused local extirpations since settlement by Europeans, although BBS trend analysis shows increasing overall numbers in Nebraska since 1966 (see below). Bobolinks also use hayfields, notably in northern and northeast Nebraska, including those planted to non-native legumes such as alfalfa (Renfrew et al 2015, Rosche 1994). However, mowing of hayfields prior to young fledging reduces reproductive success (Bollinger et al 1990); delaying haying until mid-Jul would have a significant beneficial effect; all but 15 of 150+ nests on a hayed study area in Hall Co had fledged young by 4 Jul (Dan Kim, pers. comm.). BBS data (2007-2013) indicate that Bobolinks are most common in the north-central Sandhills and northeast. Mollhoff (2001, 2016) indicated that fewest breeding season reports were from the Panhandle and the southwest, although reports south of the Platte River Valley in the east increased between the two atlas periods (1984-1989 and 2006-2011). BBS trend analysis shows Bobolinks have increased annually by 1.82% (95% C.I. ; 0.40, 3.03) statewide 1966-2015 (Sauer et al 2017), which may be partially explained by moderate range expansion south of the Platte River in eastern Nebraska. In the Panhandle, Mollhoff (2001, 2016) had breeding season reports west to Morrill Co in the North Platte River Valley; recent reports from further west in the North Platte Valley are of a pair in irrigated grass in Scotts Bluff Co 14 Jul 2007, the observer’s first sighting for the county (Kathy DeLara, pers. comm. ), and another in Scotts Bluff Co 16 Jun 2012 was considered “a good bird out here” (Alice Kenitz, Helen Hughson, pers. comm.). Breeding may occur as far west as Agate, Sioux Co along the Niobrara River Valley in wet years (Rosche 1982), although there are no confirmed nesting reports. Reports increased between the two breeding bird atlas periods in Keith and Lincoln Cos (Mollhoff 2001, 2016), although there are few records south of Lincoln Co and west of Furnas and Gosper Cos. There is a summer report 3-25 Jun 1989 Dundy Co, and reports 8 Jun 2017 of four in Frontier Co, 19 Jun 1982 Hayes Co, 19 Jun 2018 Chase Co, 12 Jul 1987 in Hayes Co, and 15 Jul 2010 near Red Willow Reservoir, Frontier Co. In the east, breeding is regular in scattered locations south to Lancaster and Sarpy (Williams 1982) Cos, with a few summer reports further south to Otoe Co; in 2007 the species was conspicuous in undisturbed native grasslands in the extreme southeast, and birds were on territory at Spring Creek Prairie, Lancaster Co by 28 Apr 2016. Good counts in the southeast were 15 in Johnson Co 8 Jul 2010 and 11 in Fillmore Co 17 Jun 2011. Mollhoff (2016) showed increased occurrence in the Rainwater Basin, where the species is now primarily restricted to prairies surrounding wetlands at WPAs and WMAs (Jorgensen 2012). There are later reports 6 Oct 2003 Douglas Co and one photographed 10 Oct 2015 in Sarpy Co.
Reports are fewer than for spring, possibly as males molt into drab winter plumage in Jul and Aug and are far less conspicuous, but also because migration is primarily nocturnal. A mixed-age flock of 16 in Lancaster Co included a few molting males, a male in Dixon Co was “molting fast” 31 Jul, a male at Rowe Sanctuary, Buffalo Co was still in breeding plumage as late as 2 Aug 1997, and one in Sarpy Co was molting 21 Aug. Most migration apparently occurs in late Jul and Aug, ending by mid-Sep; Rosche (1982) noted that large roosts occur in Sandhills marshes in Aug. Flocks form in late Jul; several flocks were noted in Phelps Co 29 Jul 1995 and 21 in “non-breeding” plumage were in Lancaster Co 29 Jul 2015. Up to 500 fed in a soybean field for about a week in 2002 in southwest Dixon Co, departing by 15 Sep. A flock of 80-100, mostly in buffy plumage, was at Ayr Lake, Adams Co 6 Sep 2008. High counts: 500 in Dixon Co 7 Sep 2002, 80-100 at Ayr Lake, Adams Co 6 Sep 2008, and 87 at Waco WPA, York Co 29 Aug 1999 (Jorgensen 2012). Female Bobolink at Mallard Haven Waterfowl Production Area, Fillmore Co 27 Jun 2015. Photo by Joel G. Jorgensen. Bollinger, E.K., P.B. Bollinger, and T.A. Gavin. 1990. 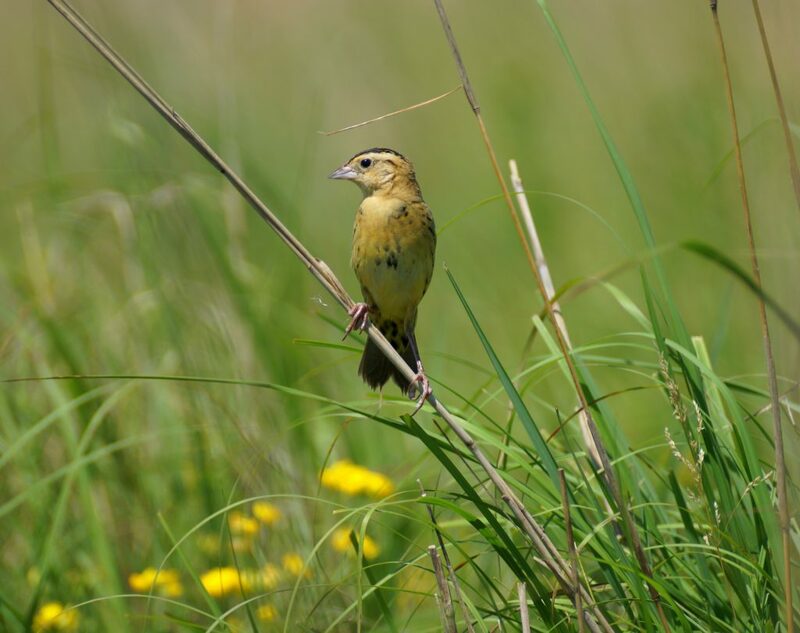 Effects of hay-cropping on eastern populations of the Bobolink. Wildlife Society Bulletin 18: 142-150. Renfrew, R., A.M. Strong, N.G. Perlut, S.G. Martin, and T.A. Gavin (2015). Bobolink (Dolichonyx oryzivorus), version 2.0. In The Birds of North America (P. G. Rodewald, Editor). Cornell Lab of Ornithology, Ithaca, New York, USA. https://doi.org/10.2173/bna.176.